An extensive biography of Miguel Antonio Catalán Sañudo (Zaragoza, 1894-Madrid, 1957), the Spanish, twentieth-century scientific researcher, remembered by the international scientific community by naming a group of moon craters after him. Gabriel Barceló, who was a follower and friend of Catalán, paints us a portrait of the teacher, his family, his relations with eminent scientists, such as Albert Einstein, Werner Heisenberg, Alfred Fowler, Niels Bohr, Henry N. Russell and Arnold Sommerfeld, among others, as well as with Luis Bru Villaseca, Juan y Blas Cabrera, Arturo Duperier, Julio Palacios, Fernando Burriel, while at the same time sketching a human profile of his subject, in an entertaining and abundantly illustrated text, full of pictures, occasionally, of great documentary value. The work looks at one of the leading lights of the so-called silver age of Spanish science. The book’s prologue is written by the philosopher Javier Muguerza and also has an epilogue written by the Spanish National Research Centre (CSIC) lecturer, Antonio Corrons, both of whom are followers of Professor Catalán. The book is completed by an extensive bibliography and numerous personal, written, graphic and oral testimonies. Gabriel Barceló tells us in his books that it was his teacher, Miguel Catalán Sañudo, who inculcated in him the interest in dynamics that later paved the way for the Theory of Dynamic Interactions. Two years ago I was lucky enough to read the manuscript of “Memoria Viva”. I wrote a few pages with which I wanted to sum up the key parts of the work. I have to admit that it proved a difficult task: the whole manuscript was of equal import. A sumptuous version of the book has now been sent to me, which Gabriel Barceló has written with enormous effort and great skill. The publisher Arpegio has produced an over 400-page, exemplary work. The truth is the publisher’s efforts have been well worthwhile. I re-read what I have already read and summarised and I feel obliged to enter into the summary of the summary, because on very few occasions in my voracious reader’s life have I come across a work that combines the human story and scientific work with such great accuracy. The whole thing starts in London in 1922. A brilliant young physics graduate arrives at the Alfred Fowler research centre and, as a fellow there, conscientiously does what he is told and diligently undertakes the tasks with which he is entrusted. However, on his own initiative and come what may, he makes the most of the hours he manages to rob of sleep, he completes some research that has been on his mind, hounding him for some time. Though a mere newcomer, he dares to use some photographic plates that Fowler has set aside for some important personal work. With them, Miguel Catalán Sañudo finds a series of lines in the manganese spectrum that display a numerical regularity from which significant results can be obtained. From these lines a series can be reached that will enable the revealing of the great secrets of the atom. At 28, and after repeating the experiment, Catalán had discovered what he called “multiplets”, a procedure that explores the energy of electrons. This in turn clearly confirms the numerical reckoning of electrons and protons. The work has tremendous impact worldwide. It represents a great advance in our knowledge of the structure of the atom and of physics in general. It greatly surpasses what had been known to date of the structure of matter. After this brilliant beginning, Dr. Fowler proposes to the new fellow that he work in the exciting world of the light of the stars. Another glorious path for Spanish science to travel. That is how it starts. He returns to Madrid and marries Jimena Menéndez-Pidal, the daughter of the great Spanish philologist. He spends a year abroad with his wife at the Rockefeller Centre in Munich, where he does important research, on the basis of which he returns to Madrid with the possibility of setting up the National Institute of Physics and Chemistry. Accompanied as always by Jimena, they travel around Germany, France, Denmark and the Netherlands to get a handle on the research being done in those countries. Catalán gets on with his own intensive research and sees his dream come through in 1932 with the opening of the Institute of Physics and Chemistry. Two years later he is granted the seat of “Molecular Structure and Spectography”. Now ranking among the world’s top scientists, he has become a real asset for Spanish science, but everything comes to a dead end in 1936. The civil war catches up with him in San Rafael, which is taken by Franco’s troops. Finding himself on the war front, he retires to the nearby town of El Espinar. From there he joins the Instituto de Segovia, where without acknowledging him any academic merits he is allowed, as a favour, to give classes in science and teach English altruistically. Bitter days in Segovia. He is arrested and accused of spying. This is an extremely serious accusation as it is punishable by death. Fortunately, there is no evidence submitted to back such maliciousness. Nonetheless, these are terrible years, extremely hard and desperate times. The universities of Boston and Princeton call out for his services. The government of Burgos refuses him to go. His research cannot progress without instruments and contacts. Such is the state of affairs until the war ends. Indeed, the war does come to an end, but not the lies and inventions that continue to beset him. He returns to Madrid in 1939. Accused of absurd and inexistent charges he is barred for no reason whatsoever from conducting his professional activity for two years. He finds himself having to earn a living as a simple, minimum-wage chemist in private companies. Strength and tenacity see Jimena found the “Colegio Estudio” in 1942, which harks back to that education that could have transformed Spain and to which mediocrity put paid. Catalán teaches physics and chemistry there. Those fortunate enough to study under him remember it as a significant event in their lives. The teacher of those two subjects fascinated his students from the word go. It was a new and thrilling way to explain. Over half of his students later chose to pursue careers in science. Gabriel Barceló among them, who was never to forget that extraordinary teacher. The ill fated man died. He died suddenly at 63. A brutal blow to the school and for all those involved with it. He was special, a cut above the rest. Chosen to suffer and overcome. He had no overcoat; he always wore a shirt and jacket and got around by bike. He instituted the idea of getting outside the classroom and getting to know the secrets of the street. It was his idea to go on interest-filled trips to different parts of Spain. But, above all, he made it a point to get to know his students well, personally, like a good father. His students remember him with gratitude. And as a homage to a man of such great worth we have the testimony presented to us by Gabriel Barceló in this beautiful book. 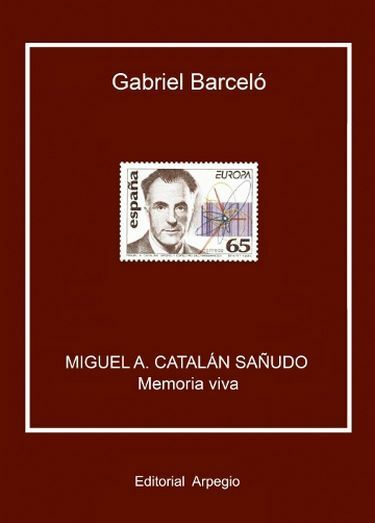 “Memoria Viva” is a fitting monument to a peerless man: the synthesis of the life and work of Miguel Catalán Sañudo. It is amazing to think of the time that Barceló must have devoted to ensuring the soundness of his work. In a book where there is not a whit of excess, where such anomalous events are related, the author has dug deep into these and extricated the undeniable truth surrounding each one. Files, photographs, correspondence, direct testimonies, notes, discoveries, etc., abound with respect to everything we are told. Moreover, Barceló exercises great care in his writing, in which no adjectival excess is permitted, paring down to a minimum any hint of excess. I would even dare to say, and believe am not wrong in doing so, that we have in Gabriel Barceló a master in the popularising of science, something which may prove extremely fruitful in a country greatly lacking in such writers. And, just one last point: Gabriel Barceló, a multi-faceted individual if ever there was one, makes me think of those men and women who manage to dominate their times and change things as if by magic. As a postscript, let us add that Miguel Catalán eventually managed to recover his chair, return to research and that his name will live forever in the moon’s craters by unanimous decision of the International Astronomical Union. But death, enamoured as always of the chosen, took him from us too soon. He could have been our Nobel Laureate in Physics.